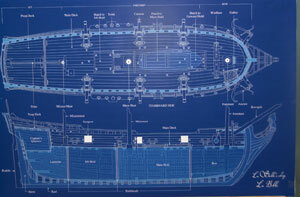 Modern blueprint of the French galleon La Belle. The blueprint process is essentially the cyanotype process developed by the British astronomer and photographer Sir John Herschel in 1842. The photosensitive compound, a solution of ferric ammonium citrate and potassium ferricyanide, is coated onto paper. Areas of the compound exposed to strong light are converted to insoluble blue ferric ferrocyanide, or Prussian blue. The soluble chemicals are washed off with water, leaving a light-stable print. A similar process was used to produce proofs for offset printing. Various base materials have been used for blueprints. Paper was a common choice; for more durable prints linen was sometimes used, but with time, the linen prints would shrink slightly. To combat this problem, printing on imitation vellum, and later, mylar, was implemented. The diazo document copying process progressively took over from blueprint during the period 1935 to 1950. The normal use was to have a wooden frame with a spring loaded back, similar to a picture frame with a glass front. The drawing would be traced in India ink on tracing paper or tracing cloth. Indoors, coated paper and tracing would be loaded into the frame which was then brought out to sunlight. Exposure time varied from less than a minute to about an hour (under an overcast sky). The operator could see the blue image appear through the tracing, when ready the frame was brought indoors. The material was washed in running water to remove the unexposed coating, then dried. It gave a clearly legible copy of the drawing with a white line on dark blue background. This copy possessed unlimited resistance to light and resistance to water that was as good as the substrate. For almost a century, blueprint was the only low cost process available for copying drawings. Once invented, no technical development was required; the process was put to widespread use immediately, notably in shipbuilding and the manufacture of railway locomotives and rolling stock. The coated material ready for use has a shelf life of two days. Every industrial area had one or two small independent suppliers who made blueprint coated materials to order. These suppliers also provided a copying service for small users. Diazo prints remain in use in some applications but in many cases have been replaced by Xerographic print processes similar to standard copy machine technology using toner on bond paper. More recently, designs created using Computer-Aided Design techniques may be transferred as a digital file directly to a computer printer or plotter; in some applications paper is avoided altogether and work and analysis is done directly from digital displays. ↑ Ware, Mike. 1999. Cyanotype: The History, Science and Art of Photographic Printing in Prussian Blue. London: Science Museum. ISBN 1900747073. Brown, Walter Charles, and Daniel P. Dorfmueller. 2005. Print Reading for Construction: Residential and Commercial: Write-in Text with 116 Large Prints. Tinley Park, IL: Goodheart-Wilcox. ISBN 978-1590703472. DelPico, Wayne J. 1994. Builder's Essentials. Plan Reading & Material Takeoff. Kingston, MA: R.S. Means Co. ISBN 0876293488. Hammer, Warren. 2001. Blueprint Reading Basics: Manufacturing Print Reading. New York, NY: Industrial Press. ISBN 083113125X. Traister, John E. 1985. Blueprint Reading for the Building Trades. Carlsbad, CA: Craftsman Book Co. ISBN 0934041059. Ware, Mike. 1999. Cyanotype: The History, Science and Art of Photographic Printing in Prussian Blue. London: Science Museum. ISBN 1900747073. All links retrieved April 3, 2019. The-Blueprints.com—Free blueprint collection with more than 80,000 3-view drawings online.